With translation, viewers understand. The right speaker? Viewers ENGAGE. Envision your market share... doubled We deliver your message in over 135 languages. Don't just communicate - captivate. Superior graphics + professional translation = SUCCESS. Professional + affordable subtitling. We produce broadcast quality within your budget. Are you looking to get the word across at an affordable price? Metro Audio and Video can help! 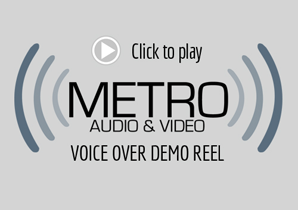 Metro Audio and Video specializes in voice over recording, video and DVD subtitling, elearning localization and production, graphic creation and translations. Our company works with the world’s top voice talents and linguists, and has become a leading company specializing in the localization of multimedia. Whether it’s for a TV or radio commercial, DVD, tradeshow, web presentation, training video, or elearning course, our staff of production professionals can help you reach your targeted audience within your budget requirements. We’ve worked with clients large and small in every industry—with exceptional results. Let us do the same for you! This month’s featured project is the English subtitled version of the new Paypal commercial currently airing in Israel.